If you like to live a glamorous, partying lifestyle in the sun and don’t want to pay a state income tax, Miami is the place for you. Miami is a major hub of all things interesting: finance, media, entertainment, and trade. It’s a famously clean city and home to South Beach, the bikini capital of the world. It’s also the center of Cuban-American heritage, and has been called the “Capital of Latin America”. Lebron James took his talents here, why don’t you? Miami has a lot to offer but it can be an intimidating city if you don’t know your way around. Lucky for you, we’re here to help! This guide will lay the foundation for everything you need to know to move to the Magic City. Now, in the words of Will Smith, Welcome to Miami! 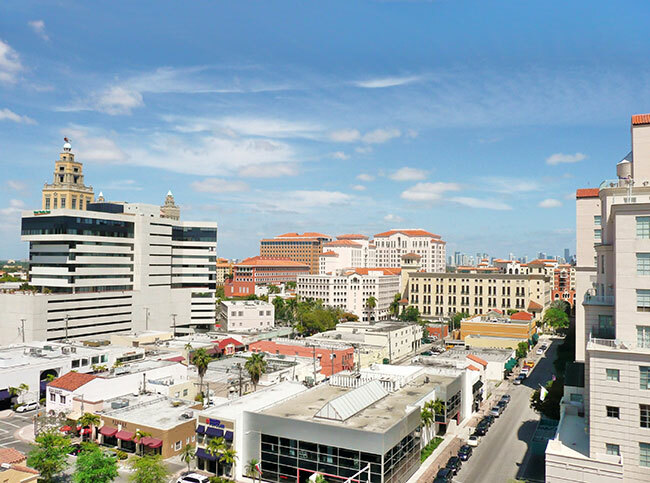 Which Miami neighborhoods are most affordable? Which neighborhood in Miami is the best fit for me? How long is the commute in Miami? How’s the walkability, bikeability, and public transportation in Miami? Where can I find apartments and houses in Miami? How much will it cost to move to Miami? What’s fun to do in Miami? And if you’re looking for more info on moving to Miami, check out our Miami move cost guide. 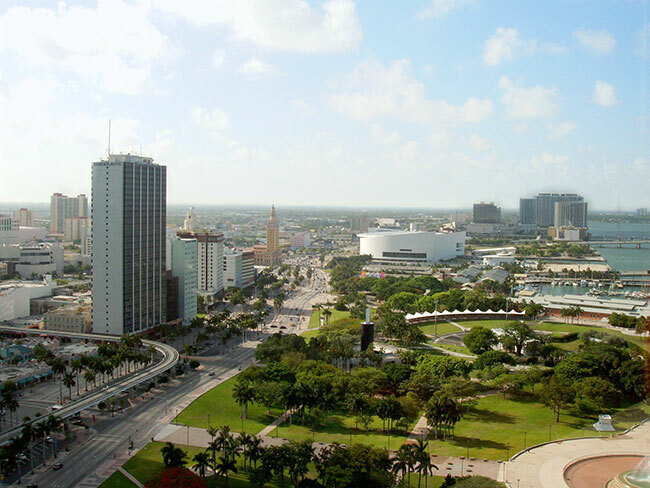 As the 44th most populous city in the United States, Miami has a population of 453,579. Florida doesn’t have a state income tax, so your purchasing power will be between 5-10% higher. The rental market in Miami is less expensive than Los Angeles and much less expensive than New York but still comparable in terms of lifestyle. Also, it’s good to keep in mind that 60% of Miami’s population is Spanish-speaking, with 30% speaking only Spanish. Because of this , it might be a good idea to brush up on your forgotten Conversational Spanish 101 skills. and here’s a drone tour of the city to help you get your bearings. Okay, now that you’re sold on moving to Miami, let’s talk about where to live. First thing’s first: set a budget. I’ll give you a minute, so take your time. Ready? Because things are about to get hot. We overlaid a rental hotspot map of the city with the major neighborhoods to give you a good idea of what the most expensive areas are. Basically, the rule in Miami, like in most other coastal cities, is that the closer your house is to the water the more expensive it will be. An apartment in Coconut Grove, Coral Gables, Key Biscayne, Downtown, Bal Harbour, and Miami Beach will run you between $2,000 and $3,000. The farthest neighborhoods from the water—Miami Lakes, North Miami, and Little Havana are where you can find an apartment for $1,000 or less. As you move west away from the ocean, the apartments will get less expensive. In fact, there are many places only a half hour from Miami Beach that go for $500 a month. So let’s get this out of the way now: if you’re on a tight budget, look to Miami Lakes, North Miami, or Little Havana. If cost is no object, look to Bal Harbour, Miami Beach, or Key Biscayne. We all want to live near people who are at similar points in their lives and the website Esri.com does an amazing job breaking down city demographics by zip code with their ziptapestry tool. 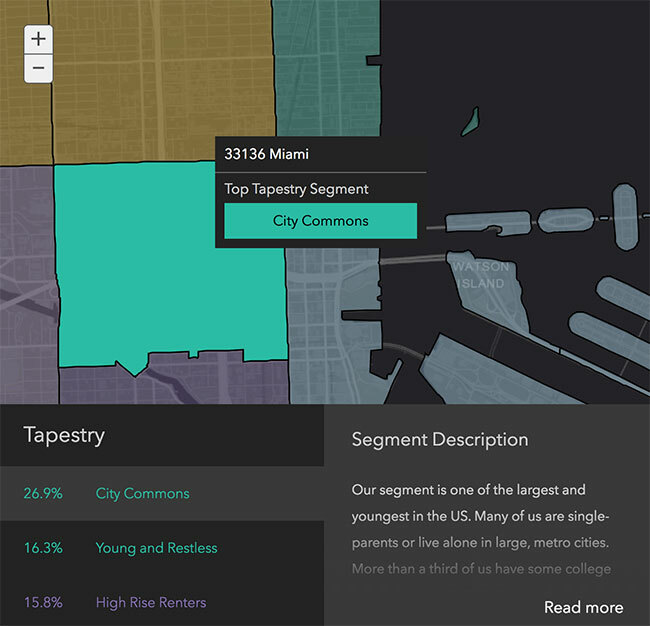 For example, if you plug in Downtown Miami (33136) into the tool you’ll get a full breakdown of the primary types of people living in that area. It’s that easy! Okay, now that you’ve found the perfect neighborhood, you need to make sure it’s close enough to where you work and play so you aren’t wasting all your time commuting. Miami is definitely accessible by car. 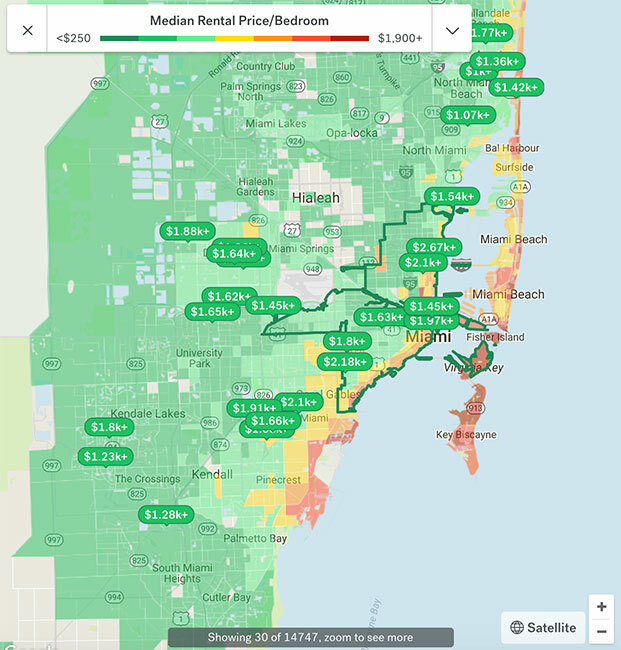 This site does a great job of breaking down car costs associated with living in Miami like gas and insurance. Like in all big cities, parking can be a real nightmate, but you can purchase parking permits here. Miami-Dade County runs a public transportation system with a Metrobus, Metrorail, and Metromover. In case you were wondering, the Metromover is a 4.4 mile electric trolley system that runs throughout downtown. This site has trackers for each of the three methods of public transportation. 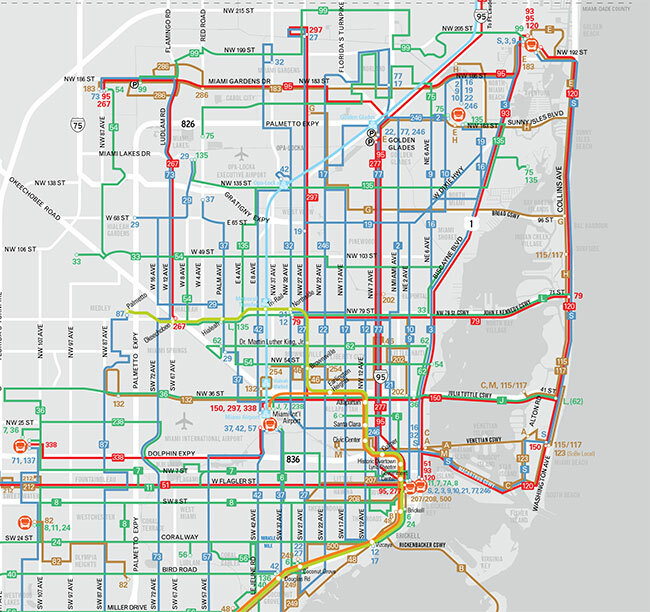 Below is a map of all the bus routes that run throughout Downtown Miami and Miami Beach. Downtown Miami is so walkable, you may forget the busses exist! In terms of walkability, Miami is amazing! With a walk score of 78, (provided you don’t mind the summer heat) Miami is the 5th most walkable city in the United States. 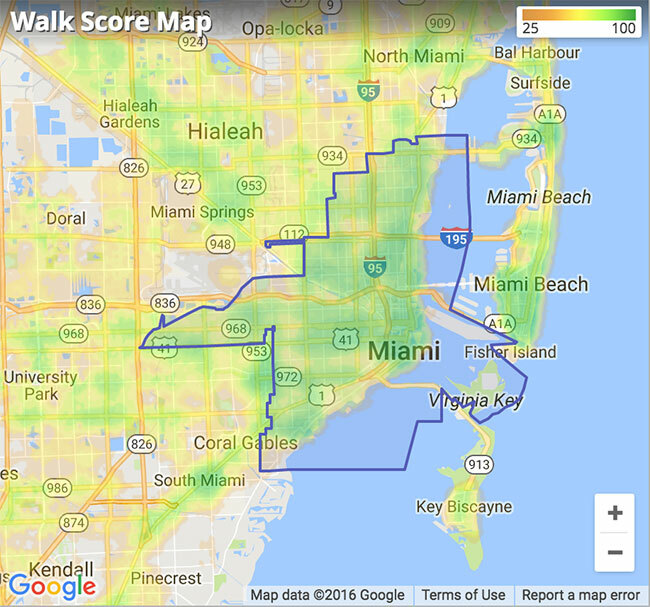 If you’re in downtown Miami or around places like the Grove and Miami Beach, it’s better to walk than it is to take public transportation or even to bike! Here is a walk score map, similar to the rent price heat map we talked about above. The greener the better. If you like walking, stay away from the yellow when looking for neighborhoods to live in. Two things: First, Miami doesn’t have anywhere close to red, so everywhere is generally walker friendly. That’s great! Second, walkability corresponds with rental prices. So, expect to pay more if you’re looking at living in a green area. Bottom-line: while Miami is very walkable, most locals suggest having a car for convenience sake. On a hot summer day, car air conditioning can be the difference between you leaving your house or not. 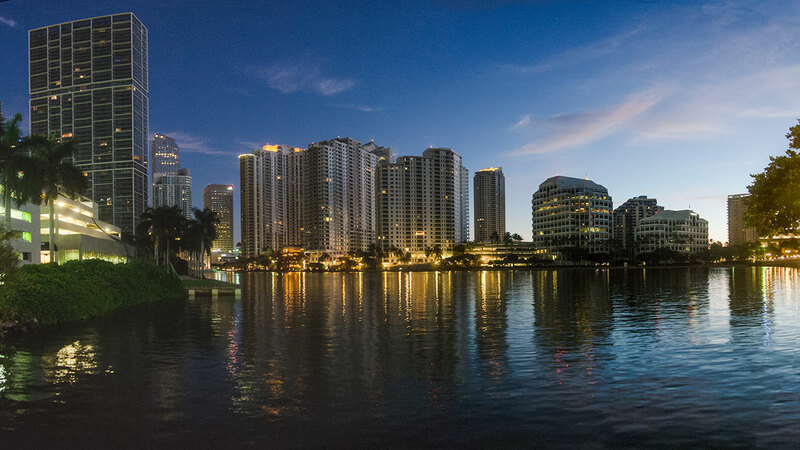 Miami is more than double the national average in violent crime, property crime, and crimes per square mile. Yeaaaaaah, not good. With 100 as the safest rating a city can get, Miami Beach scores a whopping 0. ZERO on the crime index. Still, the same rules apply here as they do in any major metropolitan area: As long as you know when to avoid the bad areas and where shady stuff is usually going down, you’ll probably be fine. Also, the Miami Police Department maintains an awesome Crime Mapping website where you can get a better idea on places to avoid. Before we start looking for apartments, let’s first consider what kind of accommodations you’ll need in Miami. It’s no secret the weather in Miami is absolutely amazing! 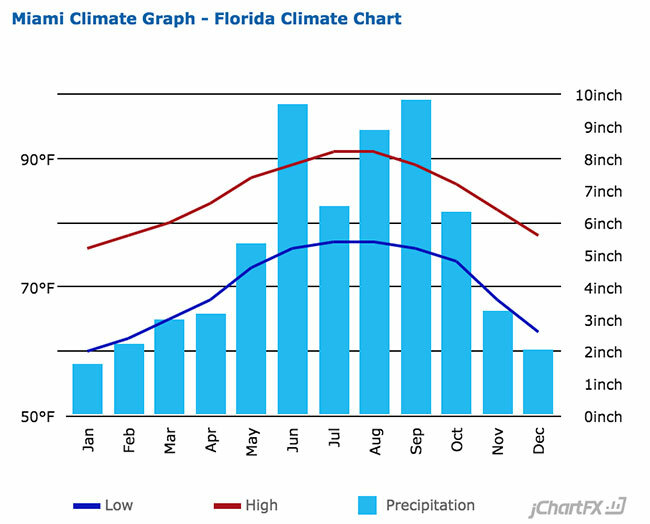 Miami has what’s known as a “tropical monsoon” climate. The temperatures in the winter feel a lot like Spring time compared to the rest of the country. Winters in Miami average around 68 degrees, with extremes ranging from highs of 80 degrees to lows of 50 degrees. Surprisingly, it doesn’t get that hot during the summer. The average highs in July and August are in the low 90s! So it’d be good to get an apartment with air conditioning, but heating is not vital. Also, there are tons of laundromats on Miami Beach and the mainland, but if you’re planning on going without a car, a washer/dryer would be very convenient. It might seem sketchy, but Craigslist is actually a very useful site for finding apartments (especially places whose owners/landlords are desperate to rent out). Each state has its own unique rental laws and if you don’t know the rules of the game a shiesty landlord just may try and put one over on you. Do yourself a favor and read a few of these links below. Miami’s rental market trends are a bit better than the rest of the country. The average rent in Miami is sitting around $2051 which is a decrease of 8.58% between 2017 to 2018, compared to a 2% increase in the United States as a whole. Miami’s vacancy rate is 6.17%, compared to 5.85% for the nation as a whole. This means that Miami’s market is slightly better than the national average. Still, in a city of this size, keep in mind that your experience will vary depending on what area of the city you’re looking in. Coral Gables may be a bit pricey, but i’ts absolutely packed with amenities. This suburb is located a convenient 6 miles from Miami proper and boasts great golf courses, gardens, art installations, and high-end shopping. Still, these perks come at the cost of a roughly $735,000 average house cost. 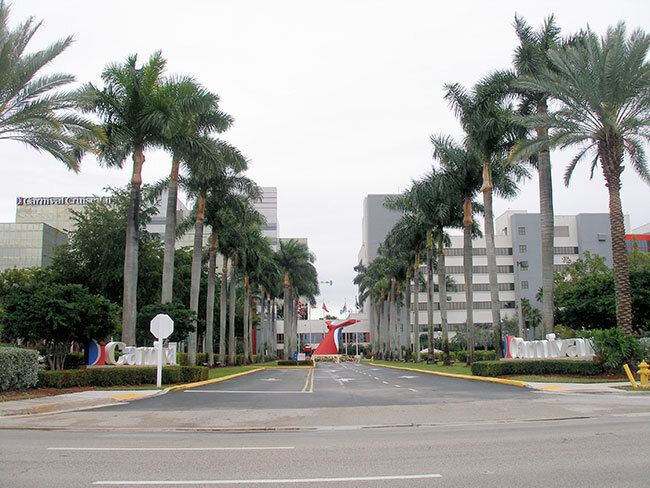 Doral is one of Miami’s nicest suburbs. It’s a 17 mile straight shot drive from Miami Beach past Miami’s airport. You can look for places to live in Doral here. If you want to get an idea on the cost of different moving services, check out our moving costs calculator. Like we talked about earlier, Miami has extremely nice weather all year round. Having said that, hurricane season runs from June-November, so you may run into some storms if you try moving during the summer or fall. Miami Beach has a Freight/Alley Loading Parking Permit Program. The permits may be purchased at the City’s Service Center, located at 1755 Meridian Avenue, Suite 100, Miami Beach, Florida, 33139. Hours are Monday-Friday, 8:30am to 6pm. If you’re moving long distance, Intrastate and Interstate moves are not regulated by Miami-Dade county. 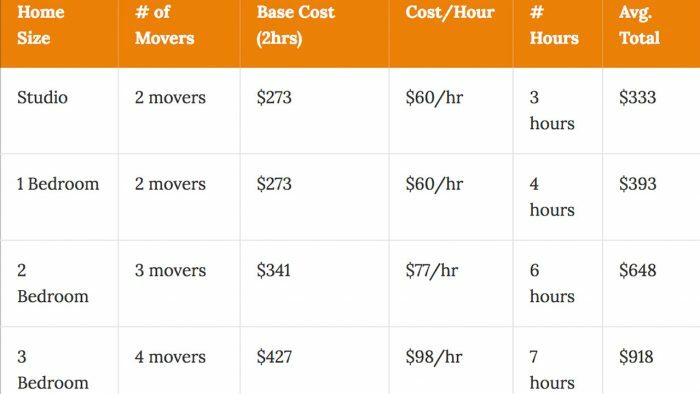 For those currently interviewing moving companies, learn more about how to find a great mover here. 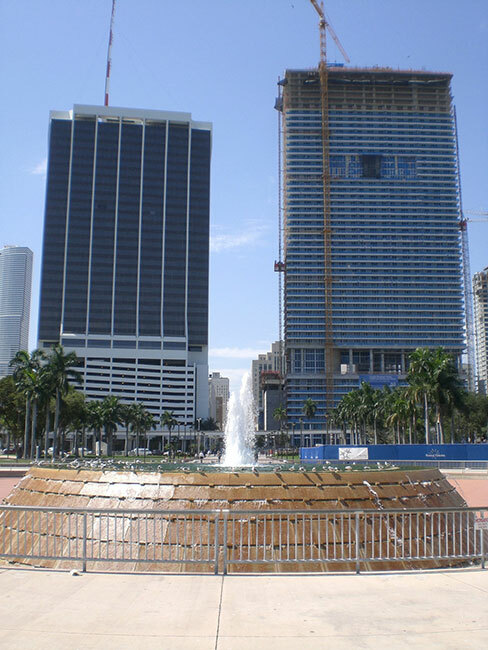 Bayfront Park is a 32 acre public park in Downtown Miami right on Biscayne Bay. You can think of it as Miami’s Central Park. Every year in March Bayfront Park hosts the Ultra Music Festival, which is one of the greatest, wildest music festivals in the world. And then, of course, there’s Miami Beach. It’s one of the premier sunbathing and tanning locales in the entire world, and the water never dips below 70 degrees, not even during the winter! To quote Rihanna, “baby, this is what you came for.” What Miami might lack in snow and safety it makes up for in DJs, dancing, and oontz oontz oontz. LIV Miami is one of the greatest clubs in the entire world, so famous that both Kanye and Drake have sung about it in their songs. 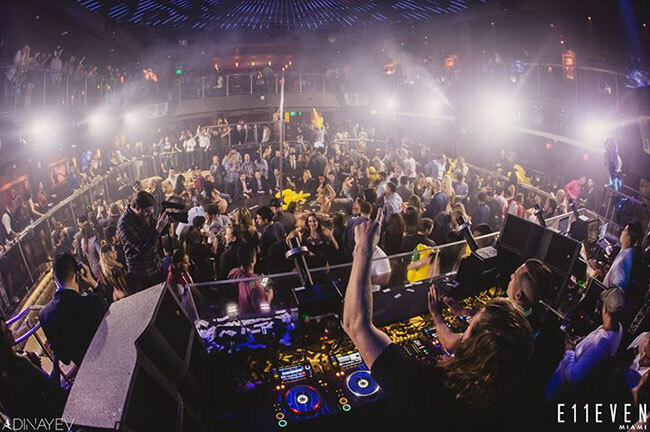 This place plays host to the world’s greatest DJs, and it’s on par with the mega-clubs you’ll find in Vegas. Other than LIV, there is no shortage of world class clubs for music and dancing. E11EVEN, STORY, and SPACE. These places aren’t cheap though! Drinks can run you as much as $10 or $20, so be prepared to drop a Franklin or two each time you roll up. If you’re not in the mood to be dropping Benjamins, check out The Broken Shaker. It’s a chill cocktail bar, and you can take a walk down Ocean Drive to end the night at Wet Willies in South Beach. 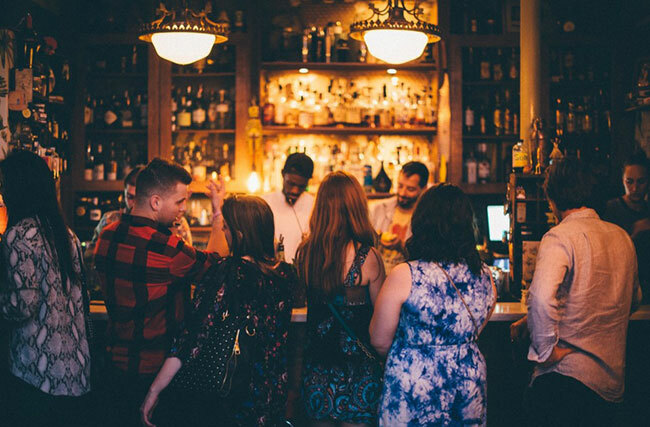 Or, if you’re looking for something a bit fancier and less focused on alcohol and loud noises, wander down to the Wynwood Arts District which boasts numerous art galleries, antique stores, and a more “eclectic” bar selection. Voter Registration: you can find the steps to register to vote here. Hopefully your vote won’t need to be recounted any time soon. Driver’s Licenses: If you’re from out of state and wish to become a Florida resident, you can find out how to do that here. Make sure you have all the documentation in order before rolling up to the DMV. Same with out-of-state vehicle registration: find the steps for registering your vehicle here. According to Florida law you have 10 days to register your vehicle after moving. Trash & Recycling: Miami has residential garbage collection twice per week. Go to the Miami waste disposal page to find your schedule. Ways to meet people: there’s always tons of ways to meet new people. One great way is to use meetup.com. The /r/Miami page on Reddit is also a great place to search for upcoming events and find lesser known tidbits and activities. What Is The Cost To Move In Miami?